What Is Garage Flooring & Which Is Best? What Is The Best Type Of Garage Flooring? Ultra Military System but is geared toward larger floors and comes complete with everything you need to do even the largest floors. High performance epoxy in both standard version or Low Voc version. If you stopped right at our primer level you would still have a better floor than you have using 90% of the competition's epoxy. Extra Heavy Duty high build epoxy is the second layer for a thick base that can take the heaviest traffic loads. Then we top it all off with our Military grade clear topcoat and micro tubular aluminum nonslip additive for a super durable slip resistant finish. Mixers, 18" notched squeegee, spike soles, mixing buckets. Etching solution and neutralizing powder. To order simply select your color and enter the square footage of your floor into the Quantity Box. We recommend that you add 10% to the actual square footage of your floor as a safety factor. All concrete floors are different and have different absorption rates. Then select whether you want the standard version or if you need the Low VOC version if you are in one of the following Low VOC states: CA, CT, DE, IL, IN, MD, MA, ME, NH, NJ, NY, OH, PA, RI, VA, KY and all of Canada. Please remember the minimum size of this system is 2500 sf. We provide complete easy to follow instructions with unlimited phone and email support. Our turnkey package is designed for first time users and no prior experience is needed to get professional looking results. We are happy to talk to your in house staff or installer. 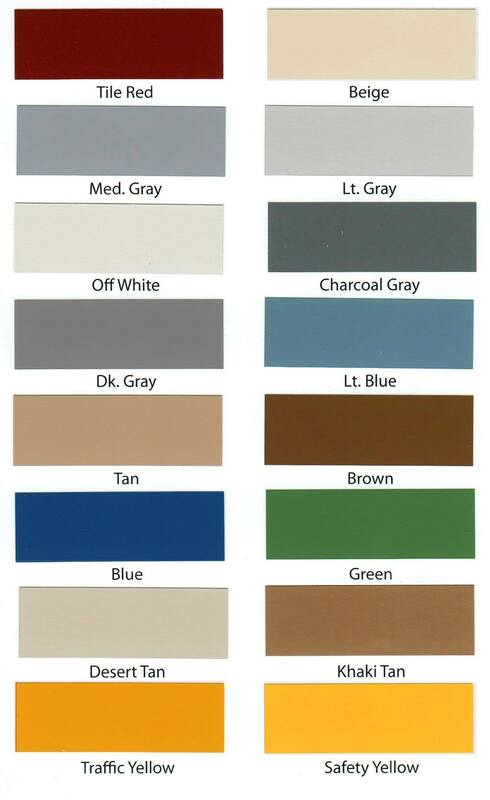 CUSTOM COLORS AVAILABLE FOR 10,000SF AND UP. CONTACT US AT SALES@ARMORGARAGE.COM OR 866-532-3979 FOR PROFESSIONAL ASSISTANCE . Armor Ultra Epoxy Flooring is sold as a complete packaged system for your convenience. Simply enter the square footage of your floor and we will calculate and package everything you need. Minimum order size for this product is 2500 sq ft and in 100 sq ft increments after that, ie: 2600, 2700, 3000.. Please average up to the next 100 foot increment, ie: if your floor is 2545 sq ft, enter 2600 into Qty Box. We recommend that you have a minimum 10% safety factor since every floor has a different porosity and texture and will absorb the product differently. Also note that lighter colors will yield less coverage also. For floors with a very rough finish such as a broom finish or that are pitted we recommend you call us to discuss since you will have to do an extra layer of the extra thick epoxy. See the Good To Know tab for images and guidance on how to do these types of floors. For jobs larger than 6000 sq ft call or email for quantity price discount. When using either the oil primer or the metal & wood primer select the "No Primer" option in the selection box above. It is not necessary to use the standard primer with one of these primers. It will also ensure you'll get the best possible adhesion between the floor and our epoxy. Q: Why is Red and White so much more expensive than other colors? A: To make Red and White requires the use of very high quality pigments in much greater amounts than is required in other colors to get that brilliant red or super bright white with no concrete bleed through. Also in the case of white it requires the topcoat to be a solid white rather than clear to prevent UV yellowing or fading. To do a red or white floor the correct way is definitely more costly. Q: What is the difference between this and the Commercial Pallet System? A: This system uses the same primer as the commercial system but then we apply the extra thick epoxy layer whereas the commercial system applies a pigmented topcoat over the primer. This system applies a clear topcoat over the high build epoxy except in the case of white where we apply a white topcoat.